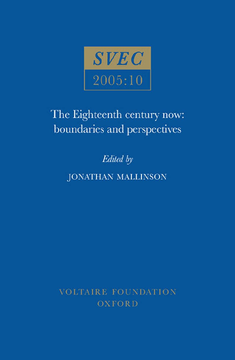 Published to mark the fiftieth anniversary of SVEC, this collection of essays examines the current state of eighteenth-century French studies; it revisits a familiar canon, investigates more recently discovered fields of enquiry, and explores new perspectives for research. Eighteenth-century studies today are characterised above all by their re-examination of categories and boundaries. We are witnessing a progressive broadening of the canon, not least in our rediscovery of women's writing, and a reinvestigation of apparently 'minor' works by apparently 'familiar' authors. There has been path-breaking research, too, in areas which reflect our broadening conception of eighteenth-century studies, from literature of travel to post-colonial writing, translation to the press, popular literature to clandestine manuscripts. Different perspectives on eighteenth-century writing have been opened up by new ways of reading which draw on research in cultural studies, history of the book or rhetorical analysis. New insights have emerged from studying the interaction of text and image, word and music, the points of contact between the worlds of science and the arts, of politics, philosophy and literature, exchanges across national and linguistic boundaries, or across the artificial divisions of 'one' century. Inclusive, interdisciplinary and international, this volume embodies the principles which inspired the creation of SVEC by Theodore Besterman in 1955; it investigates our changing images of writers and writing to the categories in which we may try to confine them, from 'Voltaire' to the 'eighteenth century'. The Eighteenth century now suggests our sense of identification with the period, the vibrancy of present research in both individual and collaborative projects, and the promise of immediacy and exchange in the electronic age. But it also evokes the boundaries which remain, financial, institutional, intellectual, and which present the challenge of the future. Its aim is as much to provoke thought as to provide answers, to stimulate as well as to celebrate.